The galvanised wire hoops are built into the cover, and the tunnels fold away concertina-style for easy storage. Lift and lay flat end allows ventilation or maximum protection. 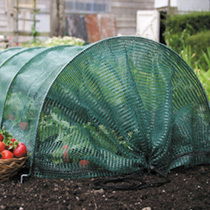 Green 5mm polypropylene netting protects against insects, birds and other pests and gives some shade for summer crops. Ideal for strawberries and vegetables. Standard Size 3m Tunnel: Length 3m (10'), Width 45cm (18"), Height 30cm (12").